We had a strange week due to testing and our party today! Math- We continued working on multiplication through arrays and ratio tables. We've been really examining doubling and how it can help us with other multiplication facts. Social Studies/Science- We started our first e4tech lesson which really encompasses math, science and social studies! We looked at a map and determined a path that someone could take based on a story problem we were given. All of our buildings on the map had to meet certain constraints. Reading/Writing- On Monday we worked on our informational writing pieces and looked at question types we might see on the state test. The rest of our week, reading time was dedicated to state testing. The project is optional, but I'm confident students and families will want to participate. 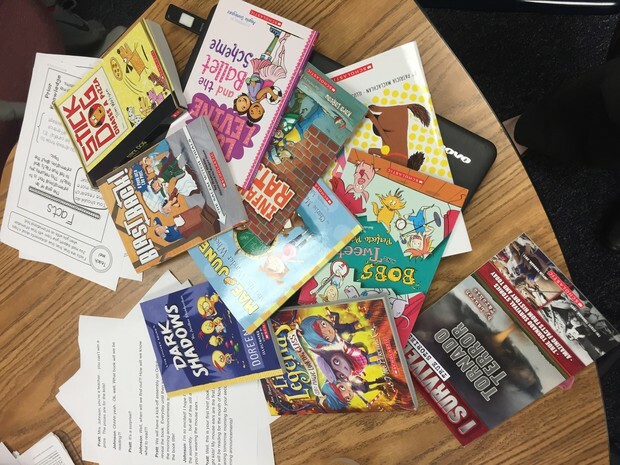 Pictured Above- New class books, donated from Scholastic Book Orders! Thank you, thank you, thank you for all of your Scholastic book orders!! You may not know it, but every time you place an order for your child, our classroom earns free books and points to purchase books. Our kiddos are SO excited when they see a book box come in. I truly believe that the way students become better readers is when they develop a love of reading. When I see their faces light up over new books, I know they are developing that love of reading. You are truly making that happen, so THANK YOU!